You wouldn’t know it from the outside, but once you step through a glorious entrance and on to the property, you’re immediately transported into a lush oasis featuring sky-high palm trees, flowers, desert plants, sculptures and a gorgeous fountain that I tried very hard not to jump into (there’s a crystal-clear pool in which to do such a thing). The grounds also boast a bocce court, fire pit and area for grilling, and the hotel’s full-service kitchen provides guests with free daily continental breakfast. Each room comes with a king-size bed, mini-fridge, microwave, private patio, and high-beamed ceilings. Nelson (who has impeccable taste) told me his plans for holiday decorations and I nearly went Elf when he described the Christmas tree he had in mind). Being at Colt’s Lodge felt cozy and warm, a quiet and welcome change from the many chain hotels that are opening in the Palm Springs area. That night I dined at Mr. Lyons, a steakhouse that’s existed for over 70 years, and really embodies the old Hollywood glamour of Palm Springs (think Frank Sinatra, Bob Hope, Dinah Shore). The menu features ingredients from local farms, which I was able to enjoy through a series of courses. Since I’m not a food critic (pick that jaw up off the floor), I will break down my meal as a person who enjoys fine dining, but has the sophistication level of a GrubHub patron. Cocktail Hour: I enjoyed a Sidecar (Park Cognac, Cointreau, Lemon Juice with a sugar rim). Kristen the waitress recommended this liquid dream to me and said it was the bartender’s favorite drink to make. Excellent, I told her. I’ll take 7. The most delicious drink to ever hit one’s lips. 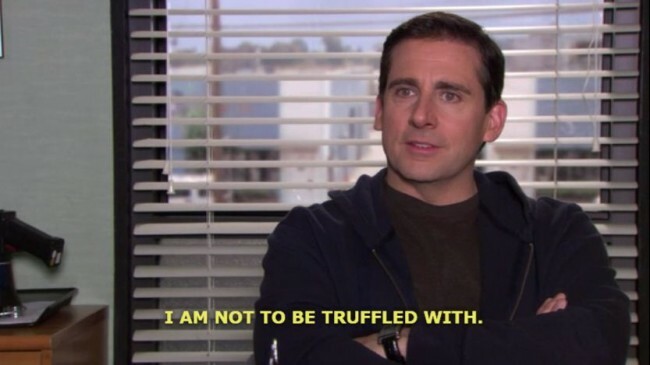 Feeling very much like Michael Scott at a five-star restaurant, I tried to sound as elegant as possible and asked Kristen what items from the menu I should choose (translation: just tell me what to eat because I wasn’t raised well). Whole Leaf Caesar with a brioche crouton, shaved parmigiano reggiano -I’m a Caesar salad snob, since my uncle makes the most delicious dressing. However, chef Chris Hora exceeded my expectations with a dressing that hit the perfect balance of creamy and zesty without going over the top. I should mention that when the food started coming out, I went into a panic because I didn’t know how to use my utensils. Enter my partner-in-crime, the Patsy to my Edina. The next dish was some delightful tar tar mixed with vegetables and served with truffle-infused crackers. I KNOW. I don’t see it on the menu now so if it is I’M SORRY KRISTEN BUT IT WAS DELICIOUS. New York Pepper Steak with marsala mushrooms. Sauces: chimichurri and demi glace, both divine. Sides: cauliflower couscous and barley risotto. Eton mess! How about that? Of all the desserts to plop down on my table, Mr. Lyons chose Eton Mess. Disclaimer: They had no idea I was a royal writer. I suspect they knew early on that I was not a food critic by the look of things (cutlery). A massive thanks to the staff at both Mr. Lyons and Colt’s Lodge. Your hospitality was second to none, and one appreciates you being wonderful hosts to a somewhat eccentric writer. God Save The Queen…and God Bless American because PALM SPRINGS RULES!